Sorry - I've been rightly chided by one or two people for failing to make clear whether the blog has shut up shop for 2009 or not. It has. The trouble is, I so much like the picture of my fly (see next post down), that I wanted it to stay as the 'homepage'. 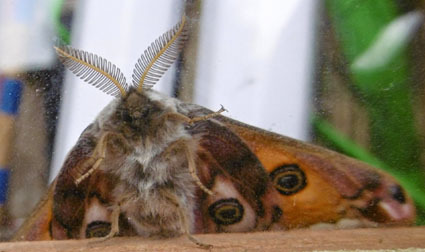 Well, it's superseded now by this entry, which is just to confirm that with the trap bulb broken, dark mornings, scant moths and general busy-ness, everything is tucked away until the end of April. I've been waiting for a final titbit to sugar the pill and my mother-in-law has now given me one: this cutting from the Daily Express. My son Tom used to work for this paper which, whatever its faults, has a sense of innocent fun missing from some other, more reputable but knowing rivals. It's got some good journalists too, including John Ingham who wrote this (and whose Dad is the fearsome Sir Bernard). 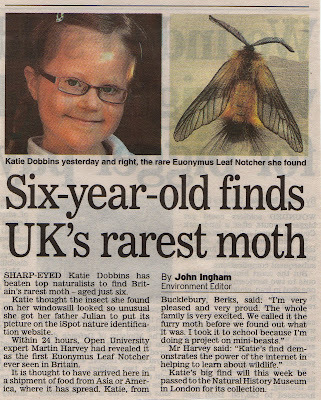 Hooray, too, for Katie Dobbins whose moth is indeed a rarity. It's actually the first to be found here which doesn't figure in my Bible, Waring, Townsend and Lewington. It isn't even in their section on 'Doubtful records and suspected imports' which features such excitements as the False Water Betony and the Isabelline Tiger. or find your nearest independent bookseller and get them there.